On September 5, 1607, the British trade ship Dragon found itself off the coast of Sierra Leone, and Capt. William Keeling and his Portuguese interpreter were entertained by the sailors staging what is supposedly the earliest recorded production of William Shakespeare’s Hamlet. We are informed that the play was presented to keep the crew from “idleness and unlawful games, or sleep.” While the existence of the so-called “bad quartos” assures us that Hamlet’s premiere was on the stage of the Globe in Southwark, England, the earliest specific dated mention of the play being staged was aboard the warped wooden planks of this worn vessel (though some have convincingly doubted the veracity of Keeling’s diary). If the accounts are to be believed, at the outset of what would be a three-year voyage to round the Cape of Good Hope in search of Indonesian spices, the seamen working on behalf of the East India Company performed the play “and in the afternoone… went altogether ashore, to see if… [they] could shoot an elephant.” Shakespeare was still alive when this production of the Danish play first premiered, his celebrated sonnets to be printed two years after that evening aboard the Dragon and a year before the ship would once again find itself in the port of London. Fully eight more plays were to be written by the Bard after this extemporaneous staging of his most famous play in view of those white-sand beaches of the gold and ivory coasts—and in view of the slaving castles, which the English had operated for a generation already. Tellingly, one of those eight plays yet to be written was The Tempest, Shakespeare’s prescient allegory of colonialism, a tale of “A brave vessel, /Who had, no doubt, some noble creatures in her;” if the records are to be believed, the noble creature in the Dragon was Shakespeare’s words. Prospero is an appropriate corollary to the crew, being as they were only the first in a long line of travelers who brought Shakespeare along on their trips to Africa, both in pamphlet and pig-skin bound volume, including characters as varied as the Victorian adventurer and translator of the Kama Sutra Richard Burton, the infamous self-promoter Henry Morton Stanley in search of Dr. Livingstone, Teddy Roosevelt on a post-presidential safari, the Danish coffee magnate and writer Karen Blixen, and the communist revolutionary Ernesto “Che” Guevara holed up in the Cuban embassy at Dar es Salaam reading from the folio. Yet it is the Dragon as origin myth that provides the most arresting image. Hamlet, as it were, has many African origins; if the Dragon’s seafaring production was the first we have official record of, than the first “talkie” film version of Shakespeare found its genesis in 1935 Mombasa, where Indians brought by the British to build eastern Africa’s network of rails had their Urdu production Khoon ka Khoon pressed to celluloid. 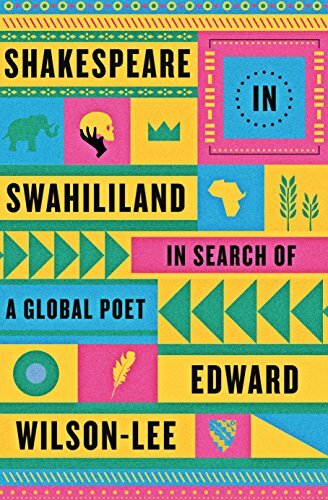 Both anecdotes are recounted in Cambridge professor and Shakespeare scholar Edward Wilson-Lee’s fascinating Shakespeare in Swahililand: In Search of a Global Poet. Reflecting on how “the earliest recorded production of Hamlet was a command performance for a Portuguese-speaking native of the West African coast” is part of his project to move a bit closer to that “Holy Grail of Shakespeare studies: an understanding of Shakespeare’s universal appeal” while remaining painfully aware of the fact that “that very universalism [has been]…used as a tool to exclude [some] from the bounds of the human.” Raised in Nairobi by American conservationists, Wilson-Lee is aware of the ways in which Shakespeare was often handmaid to the subjugation of people by English colonialists, who used the playwright as evidence of British superiority, while at the same time acknowledging the complicated ways Shakespeare was used by people across Africa in their own striving for national self-determination. Shakespeare in Swahililand functions both as a historical account of the role that the Bard has played in east Africa, as well as the author’s own travelogue through the historically Swahili-speaking parts of the continent, including Kenya, Uganda, and Tanzania, with stops outside of Swahililand in Ethiopia and South Sudan, noting that “one of the first books printed in Swahili was a Shakespearean one” in the form of a translation of Charles and Mary Lamb’s sanitized Victorian bestseller Tales from Shakespeare. His historical account moves from Shakespeare’s own day through 2012 when the South Sudanese delegation to the Cultural Olympiad staged a Juba Arabic performance of Cymbeline for London’s Globe Theater. Shakespeare in Swahililand is replete with fascinating anecdotes about the poet’s reception, while never losing sight of the complexities of that reception. These include descriptions of Roosevelt in the bush reading the Collected Works by gas lamp; Blixen arguing with her servant Farah about The Merchant of Venice, the latter interpreting Shylock as the unequivocal hero of the play; Tanzanian president Julius Nyerere’s scholarly Swahili translation of Julius Caesar, a performance of that same play with the title role being filled by Uganda’s future president Apollo Milton Obote in a 1948 version staged at Makerere University; and the brilliant performance of one of that university’s first Muslim female students, Assiah Jabir, in the role of Volumna in Coriolanus. There are even shades of our current controversy over the Central Park Shakespeare in the Park production of Julius Caesar, as a similar imbroglio occurred in Ethiopia in 1952 when the Roman tyrant reminded audiences of Emperor Haile Selassie. It’s a conclusion which neither reduces Shakespeare to Immutable Platonic Genius, nor to to colonial handmaiden viewed as great only because a bunch of genocidal Englishmen forced people to say so at the point of a bayonet. Rather, Shakespeare becomes a multivocal, contradictory, expansive author, one for whom the inconsistencies become precisely the point. This is a “universalism born not of a shared and distinct experience but of mutual contemplation of something so vast and varied as to accommodate every point of view.” And so we have an Indian version of Twelfth Night titled Bhul Bhuliyan, which recasts the opening Illyrian shipwreck as a tragic railroad bridge collapse, with Wilson-Lee reminding us that few “members of the Mombasa audience would not have known or been related to at least one of the 2,498 men who died during the construction of the line which ran from the coast to Lake Victoria.” Or we have Nelson Mandela, imprisoned on Robben Island reading and rereading the plays to keep his sanity and his spirit intact. Or the linguist Alice Werner who in 1913, while studying Bantu, had The Story of the Flesh and the Thigh told to her as an indigenous tale, realizing later that it drew its narrative from Edward Steere’s Swahili version of The Merchant of Venice. The most famous challenge to the supposed universalism of Shakespeare is in anthropologist Laura Bohannan’s 1966 classic Natural History article “Shakespeare in the Bush.” She recounts how she is asked to tell a story by a gathering of Tiv tribal elders in the highlands of Nigeria, and so she ultimately chooses Hamlet. The elders supposedly reacted with incomprehension at the strange tale: all Tiv know that ghosts are not real, no Tiv would ever scold his mother as Hamlet does, and Ophelia could not have drowned herself because only a witch can do that. As Bohannan records, the elders said “We believe you when you say your marriage customs are different, or your clothes and weapons. But people are the same everywhere; therefore, there are always witches and it is we, the elders, who know how witches work”—a telling if ironic inversion of the normalcies of western triumphalist universalism. And yet, while Bohannan’s anecdote was meant to demonstrate the fallacy of literary universalism, Wilson-Lee would argue that it only proves that universalism is innately complicated. Witness Hamlet looking for his father’s ghost on Mughal battlefields, or the Marathi translation of Romeo and Juliet inventing an entire backstory for Romeo’s first lover Rosalind (she marries Tybalt and is responsible for losing Friar Lawrence’s message about Juliet’s sleeping potion). Such revisions are as if “watching someone you love in costume, newly beautiful but still the same.” As Wilson-Lee takes pains to explain, despite Shakespeare’s original role in colonialism, African liberation proponents “and other political agitators became adepts at using the colonials’ cultural totems against them,” just like “Caliban cursing Prospero in his own language.” Yet Caliban need not only curse, for the subaltern may speak, and sing too. As a result, across Shakespeare in Swahililand we discover that Wilson-Lee’s African Shakespeare is both colonizer and colonized, Prospero and Caliban, invading Roman of Cymbeline and resisting Celt of that same play, for “everyone can, to an extent, find their own Shakespeare.” This then, is the other side of appropriation, the sublime poetry of subversion. An important book–and review–on the relativity of literature. Norman Lavers’ short story, “The Translator,” about a translator in an unnamed war-torn Asian country who transforms Macbeth in unusual ways. As if this weren’t challenging enough, Luiselli then decided to serialize her story to be read in the Jumex factory so that it would be “not so much about but for the factory workers.” The workers allowed Galería Jumex staff to record their discussions about what they’d read, and Luiselli recycled bits of those conversations in her novel. Oh, and one more thing: she did all this under a male pseudonym. Specifically, she did it as Gustavo Sánchez Sánchez, which is her protagonist’s name. At this point you’re probably laughing. You probably think that this sounds like performance art, which it might be, or like an MFA candidate’s anxiety-induced nightmare. But the thing is, Luiselli pulls it off. The Story of My Teeth is a great read. The writing is equal parts elegant and chatty, with a great sense of humor. It’s full of Big Ideas but never feels like a lecture. It’s episodic, a bit skittery, but has plenty of forward momentum. Luiselli never lingers too long in a section, or in one of Gustavo “Highway” Sánchez Sánchez’s many anecdotes or digressions into the theory of auctioneering. Highway announces early in the book that he is the inventor of a new method of auctioneering: the allegoric method. This makes him “not just a lowly seller of objects but, first and foremost, a lover and collector of good stories, which is the only honest way of modifying the value of an object. End of declaration.” Later, he explains to a young writer that “What auctioneers auction, in the end, are just names of people, and maybe words. All I do is give them new content.” In other words, he lies, and people buy. Draw connections to the art world as you will. A lot of The Story of My Teeth is Luiselli letting the reader draw connections as he or she will. The book is littered with literary references. As a child, Highway works at Ruben Darío Jr.’s newsstand and helps Darío’s wife conceal her affair with a certain Mr. Unamuno. His next-door neighbor is Mr. Cortázar. His relatives all have names like Juan Sánchez Baudrillard and Miguel Sánchez Foucault. There are so many references that the book ends with a timeline put together by Christina MacSweeney, Luiselli’s translator, bringing them all together. (Yes, the book is a collaboration with her translator as well as the Jumex workers.) It can feel a bit like Roberto Bolaño circa The Savage Detectives, listing off all the Infra-Realists and their enemies, or like going to a party full of name-dropping jerks. The difference is that Luiselli doesn’t want you to take her names seriously. Some of the names are jokes, like Highway’s cousin Juan Pablo Sánchez Sartre, who “couldn’t hold his drink [and] would inevitably tell us — around the time when the dessert was being served — that we were hell.” Some are shout-outs, like the bonsai store owned by Alejandro Zambra, the Chilean writer who published a novel called Bonsai in 2006 and whose most recent collection, My Documents, includes a story in which Valeria Luiselli is a character. And all of them, as Highway says, are just names of people. Assign them value or don’t. If you do, you might be getting tricked, or ripped off. On the other hand, who cares if you got tricked if you enjoyed the story? The Story of My Teeth is a novel full of tricks and lies. Highway’s not exactly a reliable narrator, or a reliable auctioneer. He sells his own teeth as the teeth of Saint Augustine and Virginia Woolf. But, of course, all novels are full of tricks and lies. That’s what fiction is. And as Highway would have it, stories — or, you know, tricks and lies — are the only honest way to modify the value of an object. Not just an object. At the novel’s climax, Highway auctions himself to his son. He modifies his own value. Maybe that’s what fiction is, too: a way to make ourselves valuable. And you can’t blame a writer, or an auctioneer, for that.